Spring Allergies | Clever H. - the Mag! The reaction between allergens and the IgE antibodies causes the release of certain substances like histamine, which produce an allergic reaction. These allergic reactions or diseases may involve any part of the body; most frequent being the nose and chest with resultant symptoms of hay fever, or asthma. The skin and eyes also commonly show allergic symptoms. 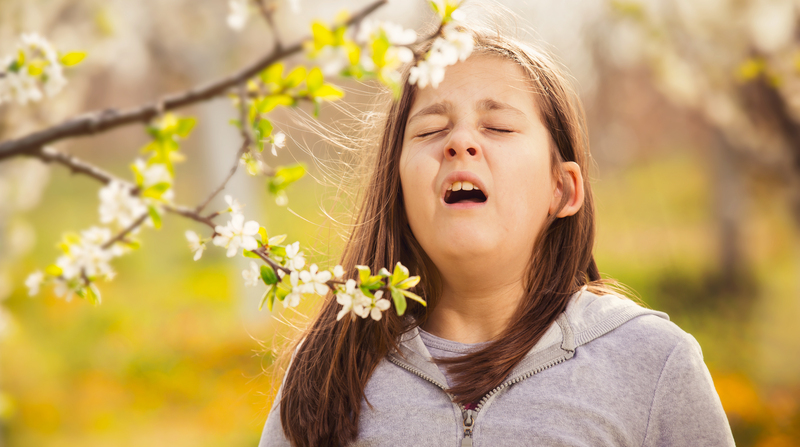 You could have a Seasonal allergy to the airborne pollen (from trees and grass) in the form of hay fever when plant pollination begins in the warm breeze of spring – a tree pollen season. You probably will feel it with every inhalation. While pollen and congress grass (Parthenium) generally create a havoc in mid spring, ragweed is responsible for the majority of early winter respiratory and skin allergies. Perennial allergies usually are year-round problems. Common triggers for them include mold spores, pet dander (dead skin and hair/feather) and dust mite. These allergens send the body’s immune system into overdrive, leading to allergy symptoms such as sneezing, a stuffy nose, and itching. Spring is a season of pollination. Trees/flowering plants release pollen that are light and dry, and can be carried far by the spring breeze. If you’re allergic to any of them you’ll start sneezing, experience congestion, and feel itchy eyes, ears, nose, and mouth. You’ll get some relief from these symptoms on rainy or cloudy days, or when there’s no wind to make the pollen airborne. But when the weather is warm and dry, and especially when the wind picks up, allergies are likely to become worse. This fungus works in a similar way. Mold, such as yeast and mildew, releases seeds called spores that are carried by the wind. They’re abundant in the air outside and tend to cause the worst allergy symptoms from spring through fall. Also, damp, humid areas such as basements, shower ceilings or curtains in bathrooms and rugs inside your home are another hot spot– a warm, humid spot for them. Allergic symptoms in skin could be itching, redness, burning or dryness leading to eruptions like rashes/hives or eczema. Skin patch test – scratching your skin with a tiny bit of an allergen, performed especially in cases of eczema. The conventional form of treatment for all sorts of allergies, whether nasal or skin is antihistamines like Cetrizine/Levocitrizine or decongestants or a combination of both. They tend to provide temporary relief. You take an anti histaminic and you are fine for some hours. The sneezing and the running nose stop. The itching in the nose and eyes disappears. But the effect lasts only for some hours. Once the effect wears off, the problem returns in full force. I have had patients coming to me who had been taking these anti allergic medicines for years together. These anti-histaminics are sleep inducing and often people tend to feel sleepy or dizzy during the daytime, which can get dangerous. The easy availability and low cost makes these anti allergic medicines easily accessible. In fact they have become sort of home remedies for allergies and people just keep popping them in without even a prescription from a qualified doctor. Homoeopathy is best placed to treat all sorts of allergies. The reason for this is that it does not just treat the symptoms of the allergies, instead it works to root out their cause – hyperactivity of the immune system. These allergens may be harmless in themselves but the hyperactive immune system goes into an overdrive when it comes in contact with them. It looks at them as offenders, tries to react in a defensive manner and wash them off by producing excessive secretions. Homoeopathic medicines repair the immune system. Hyperactivity is corrected and the body starts reacting normally to the same things that used to cause the allergies. IMPORTANT :: You’re not alone with allergies. Millions of people are allergy-prone year-round. If you aren’t getting the relief you require with lifestyle changes or over-the-counter medication, may be its time for a Homoeopathic Consultation for a symptom free springtime! « Lifelong Cystitis and Homeopathic medicine – Five Years after the Similimum.